Jaime Medwid spikes the ball back to the Muskies as Wilma Oombash and Emily Kennedy look on. Click here to view pics of the Eagles vs. the Fort Frances Muskies. Junior Boys Basketball defeated the Muskies 40-21. The Senior Boys fell 59-30. Senior Girls take Fort Frances in three straight, 25-18, 25-18 and 25-19. 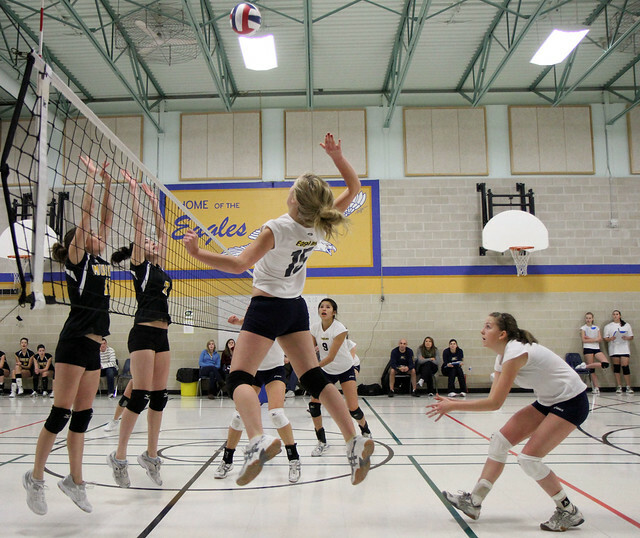 The Junior girls dropped the first two 15-25, 17-25 but fought back and took the next two 25-16, 25-19. The last set was back and forth until finally the Muskies came out ahead 15-25.